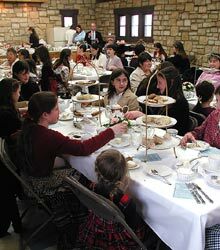 The Third Annual Mothers and Daughters Formal Teas sponsored by TFP supporters and friends is becoming quite popular in Topeka and Wichita Kansas. The February meetings managed to combine the theory of Christian tradition with the practical application in daily life. Grandmothers, mothers and daughters attended these full-day affairs. In Topeka, nearly 60 were present while over 120 came for tea in Wichita. These events were established not just as a nice get together for family, friends and acquaintances, but also as a way to fight back against the vulgarity and banality of modern society. The formal tea defends traditional values found in good manners and refinement. 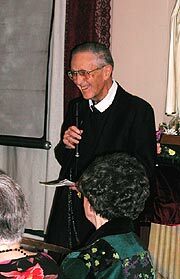 Father Walter Karrer spoke about Our Lady of Lourdes as a model. The teas included several informative and enjoyable presentations. In Wichita, Father Walter Karrer gave the introduction by speaking about Our Lady of Lourdes as a model. He mentioned the fact that Saint Bernadette described Our Lady as dressed beautifully. Thus, the first formal presentation was about the role of clothing and the spiritual dimension of not just clothing, but also other material objects. There are many things in life that have not only a practical use, but even more importantly a spiritual aspect. Clothing is one such an item. Beauty reflects God and therefore modest and beautiful clothing also reflects God and elevates the soul of the one who wears it. The second presentation was titled, “American Homes, What Style Is It?” Using slides, the speaker demonstrated the different major architectural styles of American homes. Participants saw the marvelous influences of Christian Europe with styles based on Dutch, English, Spanish, French, Italian and Greco-Roman patterns. Unfortunately, contemporary architecture tends to promote the strictly functional box which replaced the beautiful styles of the past that provided such good ambiences for families. Napkin folding and calligraphy were among the days activities. The third presentation was on how to garnish desserts. Three unique and very appetizing desserts were garnished before the audience. A nice dessert does not necessarily have to contain expensive ingredients. A dessert can be made with what is readily available. However, one can make it most pleasing to both the eye and the palate when arranged with a little careful artistry. Presenting guests with such a pleasing dessert reflects high esteem for them. After the presentation, a drawing was held for three very fortunate ladies who were able to enjoy the desserts with their tea. 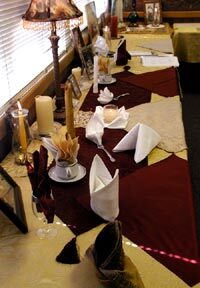 The last presentation was the always-popular hands-on napkin folding and place card calligraphy lessons. The guests all had the opportunity to learn beautiful napkin folds and simple calligraphy for their place cards. After this last demonstration, the actual formal tea began. All enjoyed the tasty, well adorned and presented sandwiches, scones, desserts and, of course, the fortifying English tea. New friends and old engaged in delightful and elevated conversation. New friends and old engaged in delightful and elevated conversation. They saw firsthand how surroundings influence souls. The atmosphere of beautifully pressed tablecloths, properly set china and silverware accented with delicate flower arrangements helped them appreciate themselves and their neighbors. All this is the fruit of the influence of the Church and of Christian civilization. At the conclusion, many of the guests expressed their great satisfaction with the day’s events and looked forward to next year. 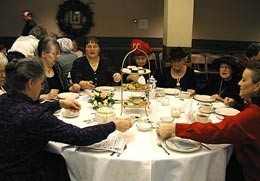 Those wishing to learn how they can set up a tea in their area, please call Francis Slobodnik at (785) 584-6251 or email him at fjslo@aol.com.